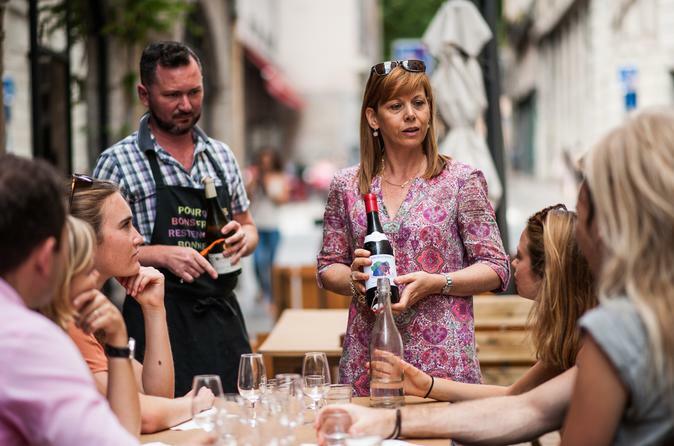 Lyon is one of France’s gastronomic centers and this 4-hour walking tour is the ideal introduction to Lyonnaise cuisine. Explore the atmospheric Croix Rousse neighborhood; visit artisan shops, bakeries, cafés, and restaurants; and sample an array of local delicacies and regional wines. Le Bouchon des Filles, 20 Rue Sergent Blandan, 69001, Lyon. We can adapt to vegetarian diet or some allergy restrictions, however we cannot accommodate a gluten-free or lactose-free regime or severe peanut/nut or soya allergies. Please specify your food restrictions during your booking. Animals are not permitted due to hygiene concerns. The tour is wheelchair and pram accessible if you notify us in advance, however please note that the streets of Croix Rousse paved with cobblestones are not recommended for prams and wheelchairs. The tour is accessible to children but they need to be accompanied by an adult and cannot participate in the alcoholic beverage tastings. Minimum numbers apply. There is a possibility of cancellation after confirmation if there are not enough participants to meet requirements. In the event of this occurring, you will be offered an alternative or full refund.